Tuesday’s visitation of the Kaliningrad stadium’s construction site brings news about the project. First one is that works are ongoing as planned, even though employment on site stands at 800 people (lowest of all host venues still under construction). There’s no risk of it not being ready by the end of 2017 as roof structure is complete and majority of the stands are ready as well. Perhaps most notably, during the visit by Kaliningrad governor Aleksandr Rolbinov we got a glimpse of the future façade. 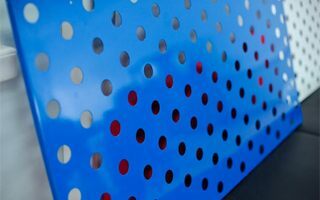 External cladding will consist of painted and rust-resistant metal plates in white and blue colours. Their alignment was already signaled in renderings, though it seemed unlikely that metal would actually be used. The plates are perforated to enable natural ventilation of the stadium. Will they make a good final impression? So far we only have a piece ready on the side of the stadium. Also yesterday it was revealed that seats will come in blue and white. Please note – not blue seats and white seats, rather double-colour ones. Whether any specific pattern will be created is still unclear. With 35,212 seats the Kaliningrad stadium will become Russia’s smallest to hold the 2018 World Cup.